How public are KIPP public schools? Follow Occupy* Posters Tumblr Blog - the main site where all Occupy* Posters stuff gets released. The 20+ most viral works by Occupy* Posters - You may have already seen this stuff making the rounds, or held high on a street near you. Check 'em out! On Facebook On Twitter On Pinterest Occupy* Posters' coolest stuff on shirts UPDATE: No one has noticed the parody proprietary "school" in this comic, Shareholder's University, or they have but have just not mentioned it in the comments. Of course, no such entity exists by name. However, all publicly-traded "schools" are exactly that: by law, they exist first to benefit shareholders, not students. Teacher Stephany Verra puts forth a pretty good summary of the Unity Caucus leadership. But even if Mulgrew took her advice Unity Caucus would just put a clone in his place to do the same things. It is time to rally people to break the Unity 60 year power grip on our local, state and national union. Every vote going to MORE/New Action is another nail in their coffin even if we don't win the entire enchilada this time. Break their control over the schools through their district rep management structure. I don't know Stephany Verra but she gets it -- now if she has to get others to vote for MORE/New Action. Are education departments in local universities virtually empty? My yoga teacher today told me she has one more year to go at Brooklyn College. I have to check with her. If there were a teacher shortage they might actually have to end the ATR crisis. Since Former Mayor Mike Bloomberg took office in 2002 and assumed control of New York City schools, the leadership in the IFT has been complicit in the privatization of public school scheme, supportive of incessant testing, allowing UFT members to become victims of age discrimination and ultimately is clearly part of the scheme to deprofessionalize the teaching profession. UFT President Michael Mulgrew, a huge supporter of the highly unpopular Common Core standard and data-driven teaching and learning, has been largely unresponsive to members’ concerns and in many cases pleas for help. What kind of labor leader would ignore his or her numbers? Members pay a tremendous amount in dues every year. What have they gotten in return? Teachers have been abused, harassed, brought up on false charges and even fired. Teachers in many schools continue to work in hostile environments – with administrators who are incompetent, inexperienced and/or abusive. They continue to harass teachers because they know very well that the UFT will do nothing about it. The City is currently in the process of settling lawsuits against them brought on by teachers through private attorneys for this abuse and harassment. Is this how taxpayers’ funds for public schools are being wasted? Does the Department of Education really need hundreds of lawyers currently employed by the New York City Department of Education? Despite what Mulgrew says publicly, the UFT leadership has taken NO steps to improve the working conditions of teachers. None. The education departments in local universities are virtually empty. We are at a precipice of a teacher shortage in New York City. The biggest losers of a teacher shortage will be the students. Mulgrew must accept the blame for the teacher shortage, miserable working environment in many schools and his reluctance to call for the removal of hundreds of horrible school administrators still in our schools. This is part 2 of my series on POTUS16. (Part 1: POTUS16: On Elections and Political Parties - Part 1). Can the Democratic Party be taken over by progressive forces or is there a need for a new party? You might term this "The Case Against Bernie." This piece written in October 2015 which is pretty predictive of what has happened to Bernie from New Politics, The Sanders Campaign and the Left. There is so much meat in this piece which delves into history of Bernie like movements in the Democratic Party and how they end up strengthening the 2 party system. Most people see the left as monolithic. It is far from that and I will be exploring some of the forces on the left when I have time after the UFT elections. Some people suggested MORE endorse Bernie to win over the Bernie people in the elections. Reading this article might provide some insights as to pushback from some of the left to out and out Bernie support. NOTE: Publishing this does not mean I agree with all aspects but a lot of it does make sense. I do not classify myself as an anti-capitalist socialist but as a left wing social democrat who wants strict controls on capitalism - which is where I think Bernie comes from. 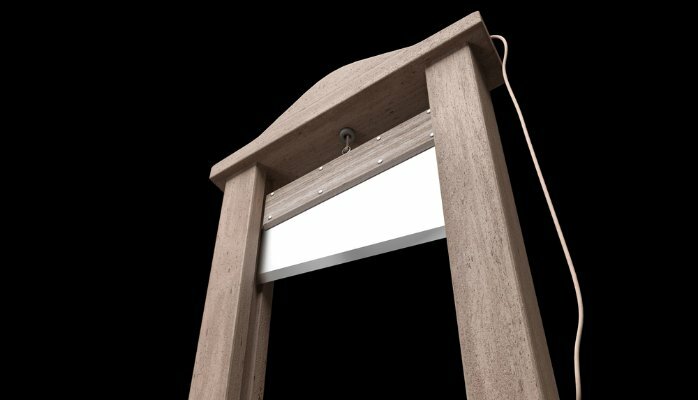 This piece comes from the anti-capitalist left. I've highlighted some of the points that strike me. Of interest to us is the relationship of labor unions to the Democratic party - especially the way Randi has embedded our union in the party. The article does not seem to take into account the Bernie fundraising which has gone beyond Hillary's. Is there a future way forward around Citizen's United? Or is it more likely to dissapate as Hillary throws him a few bones for the platform until he fades into the night? I want to do a series of posts exploring where we might be going with the Bernie and Trump movements vis a vis the current 2 party Republican and Democratic Parties which have both drifted way right of where they were - like Hillary and Obama are to the right of Nixon. The so-called "left" actually has a lot of wings - and at times I feel I have touched base with all of them - just within MORE I've seen a wide range of the left - or to use a broader more inclusive term - "progressives." I think a dividing line is whether one is anti-capitalist or reform capitalism drastically left - the latter is where Bernie Sanders seems to be coming from. The social democrats which is where I put myself. The idea of a viable party of the left with deep roots might have some legs given the post-election landscape. I posted about this sort of Occupy/Bernie follow-up in Chicago: It Won't Be Over Even if Hillary is Nominee. It is one thing to become a sort of lobby group. Some people might imagine using the super fund raising ability of Bernie people to fuel such left wing lobby group, which I think is a dead end. What is needed is a political party of sorts though I can't imagine what that might look like at this point. Meanwhile there is a war of sorts between our allies over whether to vote for Hillary or not, with even some of our allies seeing Trump as a better alternative to her - especially from teachers outraged by the neo-liberal assault on education and the role Randi and Hillary have played in it - check some of the comments on this blog and I even met at least a few people at the NPE of all places who said they would vote Trump over Hillary. Their thinking was that Hillary will be more of the same while a Trump victory would discredit the neo-liberal, war hawk wing of the Democratic Party - and Randi too and he would be so outrageous that would either move the Democrats to the left or lead to a split in the party and maybe even a split in the Republican Party too. I am meeting too many people who say Bernie is their first choice and Trump their 2nd. Something is resonating. I will explore the possibilities based on either outcome in follow-ups. There are 3 options out there for Bernie people. Mr. Talk argues against Arthur's 3rd party vote even in Blue states because he feels Hillary need to be elected with a mandate. Like Obama in 2012? That did a lot of good. I think given Hillary's neo-liberalism a mandate for her would justify those policies and any educator who has seen the assault of neo-liberalism must take that into account. If you have doubts about Hillary my follow-ups will include proof that Hillary in substance is a middle of the road Republican. I have been scoring the state math tests for a few districts in Brooklyn. Most of the scores for elementary and middle school are 0 or 1 out of a total possible of 2 or 3. Many are almost all "0" for the whole sheet. The special ed classes are almost all "0"'s as well. From the names you can tell that many are probably ESL students. Are these ESL students being instructed in their own language? The extended response questions are mostly reading tests. There are some tests written in Spanish, but if students are not taught in their language, what good does that do? Those who support testing often say that we need the tests to show the schools/areas that "need" support. Well testing to do this has gone on for over 10 years. Where is the "support" for these schools? Many have classes of 30 and over. I think this has to be a major point going forward.....okay we know these areas need support and major resources....WHERE is it? It is time for ALL the money going into tests to be spent supporting these schools. Many teachers are upset by the low scores, but some say it is the teachers fault. Teachers are soooo "uneducated". Many say that students need to learn to take the tests as they will have to take the tests later in their lives. Thank you UFT for "not educating" teachers. Before we can even think about removing bad teachers, bad principals have to go first. Many of the bad teachers who leave move up to supervisor and it is often these people that Farina is telling to go after "bad" teachers. And she protects these people. As long as even a few principals act on V is for Vendetta principles the UFT should be digging its heals in the sand. Here's a deal - for every "bad" teacher let's get rid of a bad principal. An illuminating piece from Politico. Fariña has repeatedly said she believes new provisions in the U.F.T. contract will help get weak teachers out of the classroom, including moving teachers out of the Absent Teacher Reserve (A.T.R. ), a controversial pool of teachers who have been removed from the classroom but remain on the payroll. Fariña said asking principals to weed out their weakest teachers has been her “first statement when I get into any school visit. ... I repeat it over and over again." The witch hunts are on. How nice to have a collaborationist UFT. Jonathan Halabi said it on WBAI Monday night and I said it to the school I visited when they asked how we would be different than Unity? Farina would not be able to say any of the above about the union as the DOE will get severe pushback on wasting these resources on the bad teacher hunting expeditions. Because before we can even think about removing bad teachers, bad principals have to go first. Fariña has appointed a D.O.E. official whose primary role is instructing principals on how to properly write letters about certain teachers to keep in their files. You see, they have a plan while teachers are given no plan by the UFT to defend themselves. • Some teachers are phenomenal, most are good, some are mediocre, and some are truly terrible. This spread is probably the same in every other profession. Those who are “truly terrible” should be removed before they achieve tenure; most, I suspect, leave early in their career because they can’t control their classes. We actually have many more successful teachers than most people believe; as states have reported on their new evaluation systems, more than 95% of teachers have been rated either “Highly effective” or “Effective.” Very few fell below those markers. Frankly, teaching these days is so difficult that it takes a very strong person to handle the responsibilities of the classroom. My response is that many of the bad teachers who leave move up to supervisor and it is often these people that Farina is telling to go after bad teachers. Hear from three of the candidates running on the MORE/NAC slate (Movement of Rank & File Educators/New Action Coalition) in the upcoming UFT elections. Jia Lee (President), Camille Eterno (Secretary) and Jonathan Halabi (High School Executive Board) will explain why our membership needs new leaders in our union. Mulgrew’s Unity Caucus has controlled the UFT for over 50 years, and it’s time for a change. 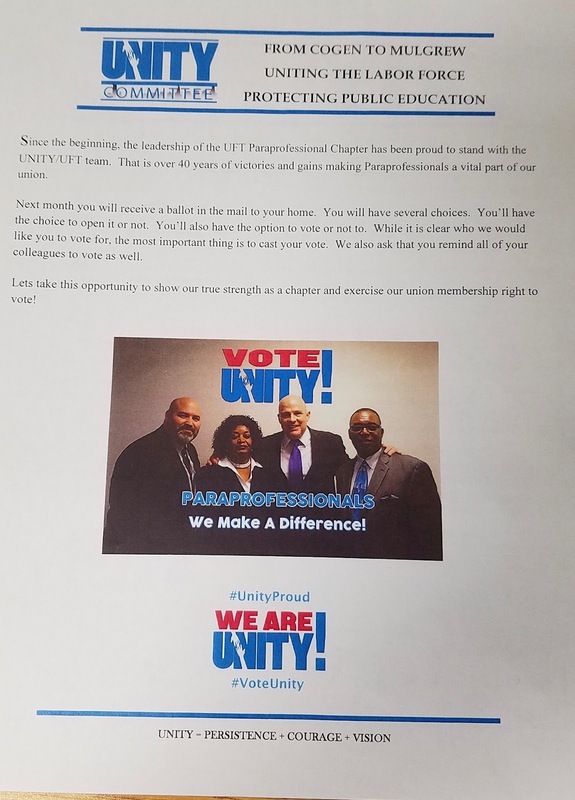 The UFT must stop collaborating with politicians and start building strong school chapters as well as unity with school communities and students, and effectively fight the forces that are working to privatize public education. Issues include: High Stakes Testing, the charterization of public schools, lack of union democracy, weakening of tenure and teachers rights, demoralization of the teaching profession, importance of Social Justice Unionism, and so much MORE! support a democratic culture. She testified before the U.S. HELP (Health, Education, Labor and Pensions) Senate Committee, on the reauthorization of ESEA. She is an opt out organizer with Change the Stakes and NYC Opt Out, a member of the Stronger Together Caucus and a national network of social justice caucuses. Humanities and the Arts High School in Queens. Ballots will be mailed on May 5th to member’s homes. The ax is getting closer to DeB/Farina's neck as the scandal reaches into the DOE and PEP. The vaunted pre-k program was so rushed through it is loaded with fault-lines, especially in certain religious communities. deB/F better pray that a kid doesn't get hurt. I watched the PEP sit there like dummies last Wed with nary a peep. There are some very arrogant people on the PEP who claim they care about children but let this stuff go. A plague on Gail Brewer for not reappointing Patrick. The Mayor could have also appointed him and he was lobbied to do so but he doesn't want someone asking questions. That is the essence of mayoral control - no accountability. I'm prepared to join with our enemies to take control away from him. Yes, we had more info coming out of the DOE under BloomKlein than under DeFarina. The Mayors office asked a nonprofit called the Fund for the City of NY to cover the costs of preK vendors who had evaded taxes, engaged in fraud and failed to hire sufficient qualified staff as well as engaged in other unspecified programmatic problems. Now the DoE is asking the Comptroller to retroactively approve these contracts so the city can pay the Fund back- in an end run around the city's procurement rules. Good story by sue Edelman below. What the story doesn't mention is the DoE is still asking the PEP to approve preK and special Ed vendor contracts before the background checks are completed- and the PEP complies. Yet not one PEP member brought up any of these issues during the contract committee discussion or during the PEP meeting. Supposedly there are backroom private discussions between the PEP members and DOE staff about some of their concerns, but the PEP has never voted down a contract and the public doesn't get to hear any of this discussion or answers from DoE, which also sidesteps the open transparent process that's supposed to happen in the case of a public governing board. Sue Edelman asked me if it was better or worse under Bloomberg- I said about the same because a lot of rotten contracts were also approved during those years. But at least during much of the Bloomberg administration, Patrick was there to challenge the DOE and force them to answer questions in a public forum. Robert Powell, the one PEP member from the Bronx who voted against the corrupt CCS contract , originally proposed to cost the city $1.1 B, also made his concerns public in that case. Now Patrick is gone from the PEP because neither the new Manhattan BP nor the Mayor would re-appoint him, and Robert Powell has left the PEP as well. Bernie may not even be involved in this for all we know but we do know things have changed as the energy of the semi-anarchic Occupy Movement has shifted to the Bernie campaign. There has been a shortage of stuff on education coming out of Bernie and his crew. Time to escalate the awareness. Real ed reformers must be involved in making sure that ed deformers don't jump in and make their phony case that deform is civil rights. (We've seen them to that in the Black Lives Movement). Right now, despite some criticisms, NPE could be a force if it doesn't get side-tracked into the Randi/Hillary stuff which will be sold as real reform. Union caucus groups like CORE in Chicago and MORE could play a role -- MORE's Mindy Rosier is already deep in the Bernie movement. Some people on the left don't want to hear the words "social democrat" and spend their time attacking Bernie and his supporters. That is the same mentality that led to the left being decimated in Germany by Hitler. I'll take Finland and Denmark any day. The progressive movement that supported Sanders existed before his campaign and will continue after it. But Sanders has expanded it and unified it in a way that creates the potential for a powerful post-election force in politics if it can retain at least some cohesion. Key allies of Bernie Sanders are planning to meet in Chicago after the final votes have been cast in the Democratic presidential primary to plot the future of the movement galvanized by Sanders’ presidential campaign. Sanders’ loss in New York’s primary this week has put the Democratic nomination almost certainly out of reach, leading many to wonder what will become of the millions of people who donated, volunteered, and supported his campaign, including many who seem unready to settle for likely nominee Hillary Clinton. The two-day People’s Summit is timed for mid-June in order to fall between the final set of primaries in California and elsewhere on June 7, and the Democratic National Convention in late July. It aims to continue building the “political revolution” Sanders often invokes and to develop a “People’s Platform” of issues important to the movement. The event’s partners include many key players — though far from all, at least for now — of the Sanders movement. 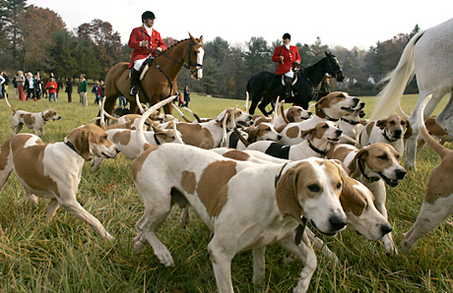 Lenchner said many other groups are likely to join. Their focus remains on the campaign, representatives of various groups involved in the summit said, but they wanted to create a plan to come together regardless of whether Sanders wins or loses. Taking the lead are People for Bernie, which grew out of the Occupy movement, and the National Nurses United union, which has endorsed Sanders and whose super PAC has supported the senator to the tune of nearly $3 million this year. They’ll be joined by the environmental group 350.org, which backs Sanders, various Sanders-aligned liberal groups like Progressive Democrats of America and pro-Sanders demographic groups. Also on the list is the Iowa Citizens for Community Improvement Action Fund, which sponsored Sanders’ earliest visits to the first-in-the-nation caucus state in 2014. And then there’s the Democratic Socialists of America. Conversations have already started in lefty circles about what happens after the primary, with a range of ideas about possible organizations, tactics and priorities. Sanders has always been as much a movement leader as he is a politician, and hundreds of volunteer groups sprouted up organically across the country to support his candidacy and supplement his campaign’s relatively light footprint. Almost everywhere Sanders’ campaign went, local volunteers had been first, organizing and opening field offices, some of which were absorbed by the official apparatus. In New York, for instance, it was volunteer efforts — not the campaign — that worked to get independent voters to change their party registration before the October deadline. “Maybe we’re on the cusp of some really interesting political changes,” Lenchner said. Contrast this with what Mulgrew is saying as James reports at the ICE blog: IS MULGREW'S DESCRIPTION OF A HEALTHY NYC SCHOOL SYSTEM ACCURATE? I wrote briefly about the April 20 PEP meeting (The "New" PEP Under di Blasio/Farina - New Boss, Same as....) Leonie has done a good job of touching on the important issues in the blog above where she posted the video of Meyer Levin students telling the truth about an invading charter - a video that had been suddenly removed from you tube but is now posted on vimeo. Meyer Levin video from Class Size Matters on Vimeo. With deBlasio facing rough waters how much longer will Farina be around? But if you are rooting for her to leave no matter who replaces her it won't get any better. Jason Goldman is the scion of the Goldman family - current officer candidate Anne, head of the nurses, and former Manhattan borough rep Jerry who was allowed to resign with full pension rights after an internal hush hush scandal. At one point the 3 members of the Goldman family were pulling down between 3 hundred and 400 thousand bucks a year. Jason started in the PR department and is now I assume working with Paul Egan or since I can't follow the comings and goings at the UFT maybe this guy Jasaun Boone. Are you rooting for di B to fall? The other day I was at a school where teachers were happy di Blasio may go down - until I informed them that the most likely replacement would be someone connected to Eva Moskowitz. Pretty sad that even with the Farina/dB people in charge of the disaster things will get worse. RBE pretty much made the same point in the Eterno posting. We know that UFT district reps stuff mailboxes in schools where they do not have someone to do it, often on working hours, our time and dime (which is someone from MORE did the same thing on DOE time they would be cooked). But even if they do it on their own time that is still a violation of some important protocols given how chapter leaders are often dependent on the district rep as their main conduit in the UFT. It's a power relationship and when the district rep is openly partisan it violates that relationship. Is it election fraud if the UFT is holding "official" events as cover? Using district reps on our dime to stuff mail boxes where they don't have someone. 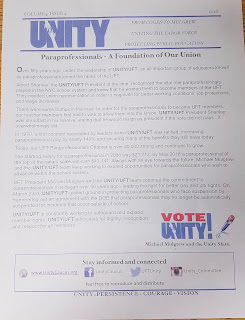 But more egregious is the setting up of phony "official" UFT events as cover for their campaign. On April 19 some kind of large gathering/celebration dinner for para’s in D27 was held. There was some spiel about how D27 para turn out is low at events and the union wanted a chance to get to know them better. This was advertised as a UFT event for paras, not a Unity caucus event. I'd imagine union dues paid for their chicken. Then this was handed out to them after the meeting and there was some campaigning. I find the whole thing blatant electioneering and highly inappropriate. District reps try to hold some sort of meetings where they invite all paras to attend a few times a year after school hours. D27 turn out for these events is by far the lowest according to what the para rep is saying. Low turn out is the reason given by her para rep for holding a catered meeting to try and attract more paras to come. (Yeah right). All previous meetings have always been held at a school and never before held at a catering hall, Woodhaven Manor on Jamaica Ave as a free dinner. The UFT people did discuss the election in general terms and the meeting featured a lot of self-praise and coy references to read this month's NY Teacher. The Unity flyers weren’t handed out until near the end. I’d be curious to dig through next years tax filings and see how much the UFT spent at Woodhaven Manor. They did an event earlier this school year at Woodhaven Manor where they asked CL’s from all the schools to try and fill a table. The reason for the event was something along the lines of "Mulgrew feels like he doesn’t know the teachers of D27 as well as he should so he would like to meet you." He showed up about 2 hours in, spoke for 15 minutes, and then promptly left. Mulgrew must have gotten to know a lot of people in his 15 minute hit and run speech. Unity has always done this but there is a sense that these events have escalated more this year than ever and that will pump up the Unity vote. I know some people will say we should a lodge protest, etc. I am still of the mind that the opposition must get closer in the school level vote (where retirees don't vote) before lodging protests. Hitting 40% in the elementary schools would be a sign of Unity power crumbling from within. Will these events gain Unity votes? Someone said "Look at what they are selling people. Why will people buy the same old crap, even for a chicken dinner?" When people question why so many wealthy people have jumped on the ed deform bandwagon they often ask how can they make money? We have heard about the real estate scams, high salaries for them and their pals, charter scams, etc. But not enough attention has been paid to the fact that teacher salaries make up probably 75% of all spending on education and if that number can be cut down significantly the money could begin flowing into the pockets of the privatizers. Teacher unions with their contracts are the major target as they want to move teachers to individual negotiated contracts like they have in charters. The problems charters have in big cities with union contracts is they have to compete for labor so they have to pay higher salaries than they want - even though they extract a lot more hours of work for what they pay. So if the union teacher competition can be removed they can lower teacher salaries across the board and open up billions of dollars for themselves. While not addressing the teacher salary issue - but they did address the massive charter teacher turnover - Yesterday on WNYC, Leonard Lopate had a great piece with Michelle Fine and Michael Fabricant, the authors of Charter Schools and the Corporate Makeover of Public Education: What's at Stake? - probably the most comprehensive critique I've heard on mass media. I bet Leonard comes under intense pressure to have a rebuttal. You know WNYC is funded by some of these slugs. 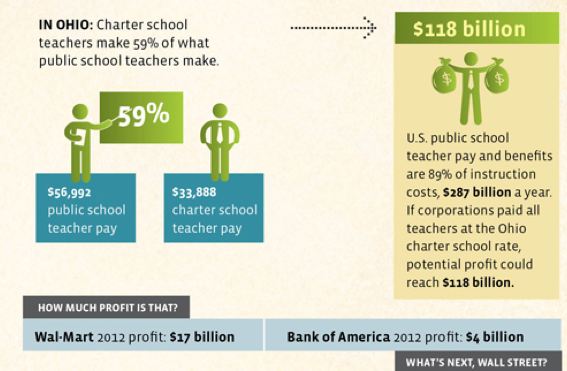 The infographic below does delve into where the money comes from to fuel ed deform. This article is from Education Uprising, the Spring 2014 issue of YES! Magazine. I was asked how MORE would be different from Unity and I said one thing I would guarantee - at the very least every abusive principal would be challenged on all levels - privately and publicly. UPDATE: questions have been posed as to the use of a tampon in this situation and our understanding is that it was not used in a conventional manner. I leave the rest to your imagination. Yesterday I spoke to the 2 lunch hours at an elementary school and spoke about my own experience in District 14 which was run by the UFT district rep who eventually became the Superintendent - why not take power directly instead of through an intermediary? The district 14 story where there was a local machine operated through the UFT deserves a book of its own which one day I may write. The route to principal ran through becoming chapter leader. Every one of these politically connected people were in Unity Caucus - so for those who wonder about my hostility to the Caucus it is rooted in my earliest experiences as a teacher activist opposing them on the district level at first and then on the city level. At the end of the 2nd lunch hour I was approached by a teacher who taught at the most repressive school in the district and she told me about the absolute fear people worked under in that school. Eventually she got out to the school run by James Quail who was slicker but not much better. She finally got out of there to her current school with a UFT transfer which was abolished in the 2005 contract. We talked about how teachers got pregnant just to get out of her original school due to a frightening principal. She told me that years later she ran into a former colleague who told her how she wore tampons every day because she would pee from nervousness every time this guy came into her room. When he retired his protege - the Unity chapter leader eventually who had moved up to AP took his place and was little better. When she moved up to Dist Supt the person who took her place continued the repression which she said still goes on today. The "New" PEP Under di Blasio/Farina - New Boss, Same as Old Boss? Aixa Rodriguez (right) led the battle to save her school. Jia Lee and Marilena Marchetti from MORE were present to support her. Where have you gone Joel Klein? Would we ever have imagined that the current DOE administration could look as cold stone deaf and heartless as the previous administration? From what I saw up there last night I can't say I see any difference. I even saw a di Blasio appointee, a former principal who came to a MORE meeting 2 years ago and I spent an hour in the bar afterward arguing with him over his anti-union, blame the teacher attitude. That this guy was appointed by di Blasio is indicative of why so many people in the schools - principals and teachers - and parents - think that when it comes to transparency and response and over regulations, nothing much has changed. Watching the Farina led PEP with the Panel sitting on a stage so far away from the audience, but not far enough away not to see the blank looks on their faces as issue after issue came up with people practically pleading for a response to repeated requests over months and even years - any response at a all - but not getting any. I have loads of video to process so this will only be a quick hit of the 3 major issues that came up. I posted yesterday:Today at PEP: Mayor de Blasio's "RENEWAL"
High on the agenda was the closing of FLAGS whose building is being invaded by a charter school - which sent a busload of people to the PEP. I asked them when we were leaving if we could co-locate their bus for people going to the Bronx so they could get a ride home. They have money to use for buses for political events. I have a lot of good video of speeches made on their behalf. Here is the brief press conference before the meeting. The charter bus arrived and they cut it short to make sure to get in and sign up before they packed the sign up list so not everyone got to speak - but at that point I was the only "press" there and I have all their comments from inside the PEP to post in a followup. This item surprised me. A group of former Hassidic yeshiva students were with Norman to protest the education they got which violate state laws. The DOE is supposed to monitor them. The Bloomberg and di Blasio admins both covered up for political reasons. Farina has been unresponsive. The powerful speeches laid bare the political arrangement as these schools get millions of dollars that are misused and misdirected. I'll cut the videos of their speeches and put them up in a few days. I have some great footage of them at the PEP but have to process it all. When they described how 40 years of teachers having their voices heard in setting school policy was dismantled in months by Monika Garg my thought was that she is the perfect principal for Farina who I can't conceive of sharing power with teachers. I believe Farina is behind the move to dismantle CPE1 - a decision to put in such an inappropriate principal can only come from the top. The teachers who spoke were amazing, yet most of them are under investigation on bogus charges. Garg pulled kids in to be questioned without parent permission or notice. And Garg has made racial comments which may prove to be the trigger - Beth Fertig from WNYC was interviewing a parent and that point seemed to interest her the most. For now I do have their press conference before the PEP. Wait till you see the two 12 year old alums have to say about how they learned at CPE1. The events that shaped Donald Trump's politics, and how he gained power. New York, NY.—Parents, staff and alumni of Central Park East 1 will deliver a petition Wednesday signed by nearly two-thirds of current families and more than 2,000 supporters to Schools Chancellor Carmen Farina demanding the removal of Principal Monika Garg at Central Park East 1. The petition delivery comes as Principal Garg has refused to address concerns raised by parents and staff at the school. 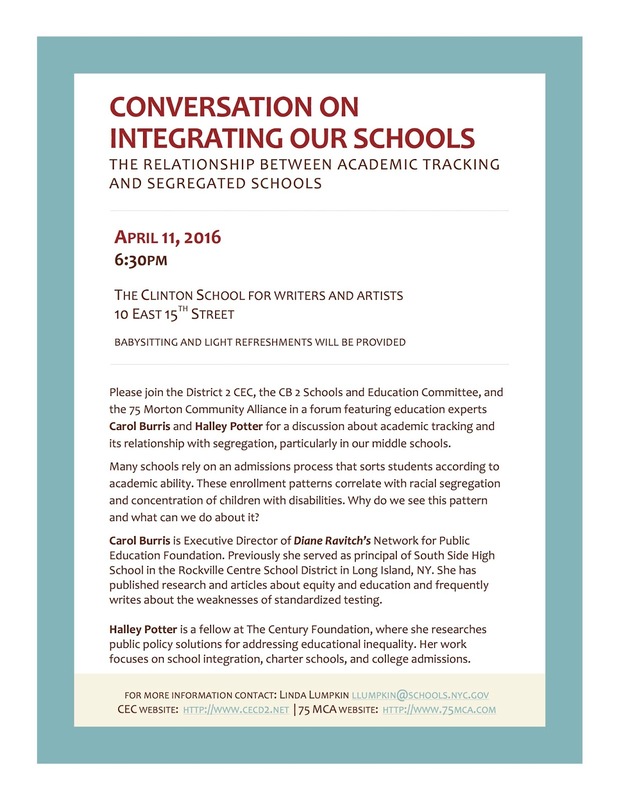 Parents, staff, alumni and educational experts will attend the Panel for Educational Policy (PEP) meeting and present their case. They plan to deliver the petition to the chancellor personally and ask for her direct intervention to support the needs of parents, students and staff. Other signatories include State Sen. Bill Perkins, former NYC Councilman and Education Committee Chair Robert Jackson, education professor and activist Dr. William Ayers, and large numbers of former teachers, family members and students. that has been documented by the Department of Education using its own metrics as well as independent qualitative and longitudinal studies. It is a nationally renowned school and one where educators go to observe and learn from best practices. However, its core progressive principles and successful pedagogical approach is being undermined under the leadership of both the principal and the district superintendent. In response, parents have launched a campaign to Save CPE 1. In addition to the petition, parents have created a website that documents the record of administrative failure, provides metrics showing that CPE 1 is a remarkably successful school and offers parent testimonials that show the diverse needs this school is meeting. In March, she interviewed several very young children as part of investigations of veteran teachers and staff. The parents of these children were not notified before or after these interviews. Veteran teachers have described their working conditions as intolerable. Several have considered leaving. The website, savecpe1.org, offers an extensive timeline detailing the pattern of administrative mistreatment over time. It also provides just a few samples of more than 20 testimonials from families about what a Central Park East 1 education has meant for them and their children. It explains Central Park East 1’s unique curriculum and pedagogy as well as its success - as measured by the Department of Education’s own metrics. Today at PEP: Mayor de Blasio's "RENEWAL" means public school "REMOVAL"
The correlation between the Receivership and Renewal program and the sites where charters are opening and expanding is undeniable. And there is the long-running battle led by Aixa Rodriguez and Jane Maisel to save FLAGS. The PEP meeting should have some life. MOREs will be there as well at the DA and the post DA happy hour. New York City-- Bronx high school, Foreign Language Academy for Global Studies (FLAGS), may be closed by a vote of the Panel for Educational Policy, held this evening, Wednesday, April 20th, despite the fact that it was classified by NYS as a Receivership School and by the NYC DOE as a Renewal School and was supposed to have time and support renew itself. Its space will be given to a charter school, as the DOE has recommended, with the full cooperation of the current UFT leadership. At 5:15 p.m., families and teachers will hold a press conference before the Panel for Educational Policy (PEP) votes. They will decry this betrayal and explain how school closures perpetuate systemic segregation and racism, while serving the private interests of charter school profiteers. “The DOE loves to break up schools into small schools, but their love isn’t sustained once there is a choice between a small school and a charter. It looks as if the small school movement is nothing more than a method for picking off public schools, one by one, as their buildings are demanded by charter schools. And the schools that are being closed are in communities with the fewest economic resources.” observed Jane Maisel, member of Change the Stakes. Rodriguez describes a cascade of problems set off by the threat of closure: teachers looking for other jobs, the school improvement grant only distributed in February which was the same month the proposal to close FLAGS was delivered, while students were not informed of the closure with enough time to participate in the first round of the high school application process. At the April 5 meeting, the school community was already so resigned that not a single parent, teacher or student spoke. Senior Deputy Chancellor Dorita Gibson told the audience that it is never easy to make the decision to close a school, and that it really is not possible to run a good high school with only 100 students. 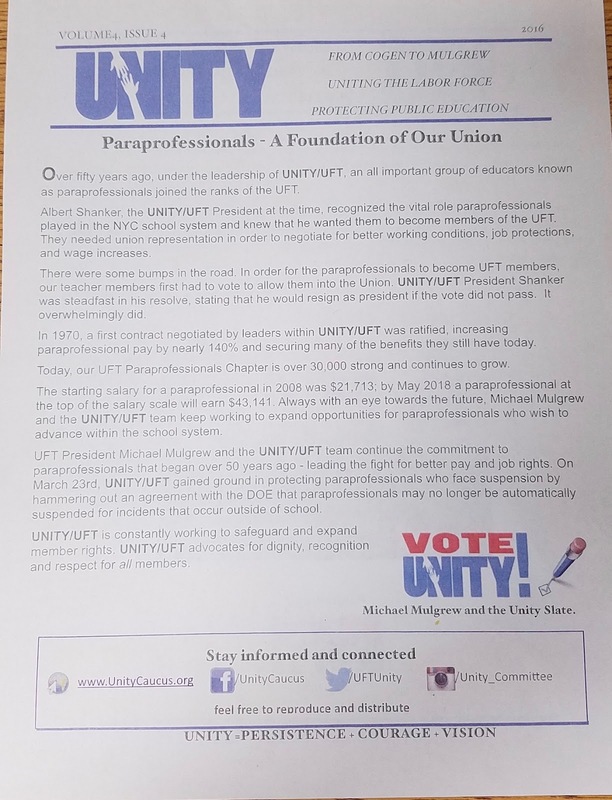 This was the same argument used with the recent closure of three other schools, and was supported by the UFT’s current president, Michael Mulgrew. Yet over the past year, the school staff’s multiple suggestions for attracting new students were all rejected by the principal. 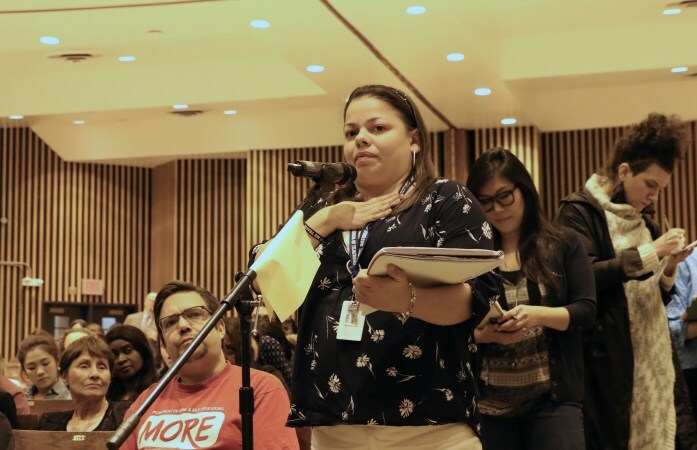 When a CEC 7 member suggested that the DOE should keep its commitment to the students by reviving rather than closing the school, building on the strength of the mostly multilingual student body, her ideas were dismissed. Apparently occupying space that has been requested by a charter school is tantamount to a death sentence for a school. Teachers and parents do not accept the DOE’s chilling logic. Parents and teachers ask the PEP members to make an independent judgement on this trend of sacrificing schools, but we will be surprised if the members of the PEP are willing to resist giving their rubber stamp approval to the DOE’s decision. Jim Donohue teaches English at Renewal School JHS 145 in the Bronx. His school fought to prevent a charter co-location during high stakes standardized testing season last year. According to Donohue, "Success Academy came into our school last year and pointed out the classrooms they wanted. The DOE welcomed them with open arms and told us to get packing. We have been scattered across 4 floors of the building, and Success Academy has beautifully renovated the 19 classrooms that they staked a claim to. This is defined as RENEWAL." Tonight the PEP will also vote on the expansion of Success Academy Charter School Bed-Stuy 1 at the site of Foundations Academy, a Renewal School that will cease to exist after this year. The correlation between the Receivership and Renewal program and the sites where charters are opening and expanding is undeniable. Concerned teachers and parents wish to make this hypocrisy clear to members of the PEP. Closing Renewal Schools and allowing charter schools to take over their space undermines the restoration Mayor de Blasio promised and institutes a climate of fear and demoralization. Advocates demand a moratorium on public school closures, demand that city officials join NYC citizens in fighting the law that requires the DOE to pay for charter school space, and that all public schools be meaningfully respected and given a genuine chance to thrive. The upshot is that not only do poor kids benefit when they go to higher achieving schools but so do the wealthier kids. And in fact by going to schools and being in classes "of their own kind" all students suffer. Can people in the wealthiest district in the city be convinced? CEC2 President Shino Tanikawa asked me to tape an event she was running with Carol Burris and researcher Halley Potter on integrating schools in CEC2. Shino presented the final segment. Given the controversial nature of the topic, especially in the high performing Manhattan district, Shino calls it a "conversation". We know how parents fight to get into certain schools and how resistant some people can be to making schools more diverse economically and racially so doing this took some guts. I had to miss a robotics annual dinner to tape this and almost pulled out. But when Shino asks for a favor I will do whatever I can to be there and I am so glad I went as I learned so much. The event was held at the Clinton School for Writing and the Arts on E. 16 St - and they served pizza which made me happy. What I learned is on these 3 segments, one for each speaker. Carol Burris does a full presentation on the experience in Rockville Center. There was a bit of scoffing from some people about using a wealthy Long Island district as a model but Carol later pointed out that District 2 and Rockville Center are very similar in demographics. I included the Q and A where Carol addressed some of the challenges. Halley Potter is a fellow at the Century Foundation and presents some of her research on integration. Shino put things together with some specifics on the schools in District 2. District 2 held a forum Monday about school segregation and the impact sorting students into different programs or schools based on their academic records. The next New York City school district to come up with its own plan to combat school segregation could be Manhattan’s vast District 2, where some schools do not reflect the district’s diversity. At a public forum Monday about integration, parent leaders argued that the selective admissions systems used by many of the district’s middle schools have worked to sort students along race and class lines. Several districts across the city are probing the link between school admissions policies and segregation, and considering alternative enrollment systems that would promote diversity. Now some parent leaders are hoping that District 2, which includes some of the city’s wealthiest enclaves and its most sought-after schools, will join them. Districts 1 and 3 in Manhattan and District 13 in Brooklyn are exploring a type of admissions system known as “controlled choice,” which is designed to curb school segregation. That model matches students with schools based on their preferences as well as information such as their family’s income level, so that high and low-income students are spread evenly among the district’s schools. Funded by state integration grants, Districts 1 and 13 are months into a public planning process around new admissions systems. While the city education department has not committed to adopting their final plans, officials have said they will at least consider them. On Monday, Tanikawa said she hopes her district will begin a similar process of reevaluating the way its students are assigned to schools. She said that could include setting school diversity goals, recruiting under-represented families to enroll at specific schools, and changing the admissions policies at the district’s middle schools. “I’m hoping this is the start of a series of conversations on this,” Tanikawa said, adding that she would like the district’s education council to form a diversity committee and to apply for one of the state grants. The majority of District 2’s schools with middle grades screen at least some of their applicants using a variety of criteria, including the students’ state test scores, attendance records, interviews, and writing or math assessments. Some of the highest-performing middle schools — including East Side, The Salk School of Science, and the Clinton School for Writers and Artists — enroll smaller shares of black, Hispanic, and poor students than the district average. The discussion about admissions policies and diversity has lately centered on a new West Village middle school, known as 75 Morton Street, set to open in 2017. Some parents have called for the school’s catchment area to be drawn so that it enrolls a mix of students from different backgrounds. Carol Burris, the former principal of South Side High School in Long Island, gave a presentation at the forum about her former district’s years long effort to phase out separate classes for high and low-performing students. She summarized years of research showing that mixed-ability classes benefit lower-skilled students and do not harm their higher-skilled peers.